Onions are my all time favorite vegetable and smothered in a bacon cream sauce; how can you go wrong? 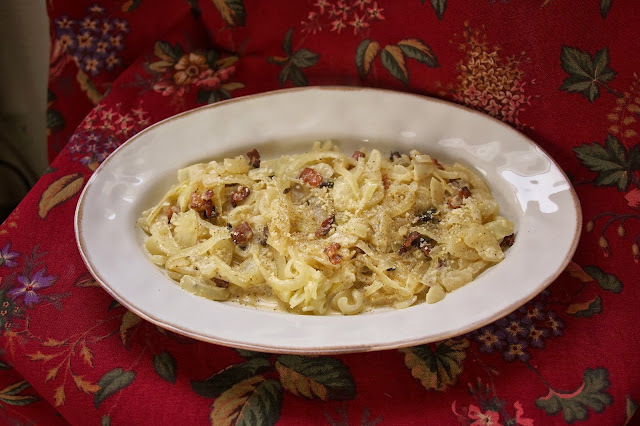 It did seem strange to put the classic Spaghetti Carbonara sauce over onions, but it worked. It was delicious with a big slice of crusty bread to soak up the juices. I also think in this age of dietary restrictions the more gluten-free recipes one has up their sleeves the better. I have a few friends with Celiacs disease who would love to dine on a healthy dinner like this one. It is lower in calories than pasta, and onions are super healthy for you. Onions are a very good source of vitamin C, B6, biotin, chromium, calcium and dietary fibre. In addition, they contain good amounts of folic acid and vitamin B1 and K.
Note: As a member of French Friday's with Dorie I am not allowed to print the recipe. I invite you to take a look at this wonderful cookbook "Around My French Table" if you are interested in this or any other recipe I review. Click here to see how the other Dorista's did. Thank goodness, I never cried so much cutting up 2 pounds of onions. This one was a tear jerker for me too. Luckily it paid off in the end. And you are right, always good to have some ____-free recipes in your back pocket for guests who can't eat this or that. I saw Mary used a mandolin I wonder if that would have been less tearful. Glad to hear you enjoyed this too. I only made a 1/4 recipe, so the only tears I experienced were tears of joy when the tough to please man liked this one. This was a keeper, for sure! It is funny how surprised all of are about this recipe. Dorie does that sometimes. Thanks Nana,,, we really enjoyed it. though my family liked the idea of throwing it over pasta. This was really good, and who knew that onions were so good for you! Those of us who are obsessed with onions have always tried to find health reasons to justify our onion addiction. I still can't believe this combo of items I had on hand ended up so amazing. My husband was basically shoveling this in....though I graciously did not describe it that way in my post :) You photo is lovely. Glad it was enjoyed by all. Merry Christmas !! Dorie surprised all of us with this one that's for sure. Merry Christmas to you too Tricia..
You're right Diane, it is good to have recipes for the gluten intolerant these days. I'm glad you enjoyed it. I did too. Spaghetti Carbonara has always been my go to meal for picky eaters... now I have a restricted eater recipe too. I think almost everyone likes cream and bacon flavoring. Still trying to decide if I really liked it. It was better the next day. I can understand your dilemma, because it is just so unusual a recipe. Diane, this was enough that I made it twice in a row just becos DH asked that I made it for him after seeing me eating it on toast! oops, left out 'GOOD' before enough! Funny that onions are one of your favorite vegetables. I usually think of onions more as a flavor that blends into the background of so many things, but not usually a star on its own. This was definitely interesting. I used the leftovers in a frittata. It was delicious. Oh wow, in a frittata... brilliant. That must have been delicious. Merry Christmas to you too. P.S. I hope you and your family have a Merry Christmas! We loved it, too - and Kevin was pleased to find another gluten-free dish that didn't seem like a compromise. A very Merry Christmas to you and your family! Exactly, non compromising feel to it. Merry Christmas to you and your family as well. We ate this one over pasta so we missed the healthy aspect, but it sure was good. I bet it was delicious with good bread. Hope you're enjoying the holidays! Yes, we did have a little bread with it. I don't consider carbohydrates unhealthy, but for someone with Celiacs disease this is a wonderful no compromise recipe. This is a great Carbonara, it looks delicious! Thanks so much for sharing with Full Plate Thursday and wishing you abundant blessings in 2014! I thought this was yummy too! Good idea to keep this idea on hand for friends. I always like to make something "real" that also happens to not have gluten (or whatever). Happy you enjoyed!